Christy works as the third generation civil litigation attorney Gilbert & Bourke LLP in Palm Springs. Christy earned a J.D. from Stanford Law School and a B.A. in Cultural Anthropology from UC Santa Barbara. Christy serves on the board of directors for Women Leaders Forum, Well in the Desert, Democratic Women of the Desert, and Shadylane Mobilehome Park, a tenant-controlled mobilehome park in the Eastern Coachella Valley. Before joining Gilbert & Bourke, Christy received a Stanford Law School-Stanford Public Interest Foundation Fellowship to establish a legal aid clinic for domestic violence survivors within the Coachella Valley’s only domestic violence shelter, Shelter From The Storm. 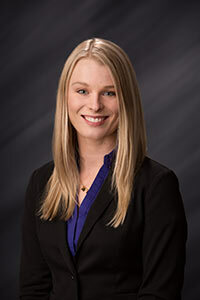 Christy has also represented rural farmworkers in civil rights, housing, and employment litigation at California Rural Legal Assistance in Coachella, California. Christy focuses her practice and pro bono efforts serving low-income and underserved communities of the Coachella Valley, including people with disabilities, LGBT clients, homeless clients, injured workers, personal injury victims, and victims of discrimination and violence. At Gilbert & Bourke, Christy practices civil litigation, personal injury, worker's compensation, and Social Security Disability law. Christy is proud to live in Palm Springs, California with her husband Adam Gilbert and their cockapoo dog Layla.